This is the latest edition of our classic CICS book. Since the first edition of this book came out in 1984, more than 200,000 COBOL programmers have learned CICS from it. To a large extent, this book set the standards that were used for developing CICS applications in enterprise COBOL shops throughout the world. Although this edition was published in 2001, trainers at mainframe shops tell us that CICS programming is still being done the way it’s presented in this book. Today, however, most CICS work is maintenance programming on “legacy” applications. 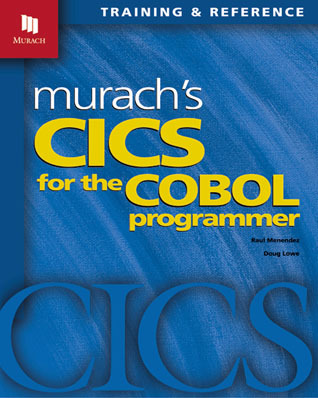 I have just finished reading every page, from the front to the back, of Murach’s CICS. I must say the ‘paired pages’ informational presentation format is simple but pure genius. The book has demystified and shown me the true light in some areas that have been more than somewhat confusing for many of my more than 25 years in the business." This book is for COBOL programmers who want to learn how to write CICS applications for IBM mainframes. The only prerequisite is that you know how to develop mainframe COBOL programs that process indexed files. If there's any doubt about that, please get a copy of Murach's Mainframe COBOL. It's a quick training course, an efficient COBOL reference, and the ideal companion for this CICS book. But this book is also for experienced CICS programmers. It allows you to learn features you haven't used before, as you need them. It serves as a quick reference to the CICS commands and features you use most on the job. In short, it helps you work in a more efficient and productive way. CICS (Customer Information Control System) is the world-class transaction processor that's used for interactive transactions on IBM mainframe computers. The vast majority of the CICS code for those applications is in the form of CICS commands that are embedded within COBOL programs, which is why this book is called CICS for the COBOL Programmer. At that point, you'll be able to develop CICS programs on your own, and you'll have a solid understanding of what you have to do to become a proficient CICS programmer. Then, the three chapters in section 3 present some additional CICS commands and techniques that you'll use regularly. And section 4 presents a complete CICS application that consists of four programs. Once you understand the design, BMS mapsets, and COBOL code for these programs, you'll have the skills of an entry-level CICS programmer in industry. To complete your mastery of CICS, the chapters in the last two sections of this book present commands and skills that you can learn in whatever sequence you prefer. Specifically, the chapters in section 5 present the CICS commands and techniques you need for file and database processing. And the chapters in section 6 present advanced CICS features and skills. Chapter 20 shows how to design, code, and test CICS programs in which the "presentation logic" (all the functions related to sending data to and receiving data from the terminal) is separated from the "business logic" (the functions that process the data). Last, because maintenance programming is the norm in every CICS shop, chapter 22 presents the type of code that you may come across as you maintain older programs. If you're new to CICS, this book gets you started fast. In chapter 2, you'll learn how a complete CICS program works. And by the end of section 2 (just 6 chapters), you'll be able to design, code, and test CICS programs on your own. Once you complete the first two sections of the book, you can read the chapters in sections 3, 5, and 6 in whatever sequence you prefer. That's because the chapters in those sections are designed as independent modules. We refer to this as "modular organization," and it helps you get the training you need, when you need it. 12 full programs and dozens of coding segments illustrate the design and coding practices that are used in the best CICS shops. Whether you're a beginner or a professional, you'll boost your productivity by using these as models when you code your own programs. Since CICS applications run on IBM mainframes, this book is best used in a training program or environment that gives you free access to an IBM mainframe. Then, you can compile and test your programs on that mainframe. If you don’t have access to an IBM mainframe, you can still use this book to learn how to develop CICS programs. You just won’t be able to practice what you’ve learned until you’re on the job. This book combines all the reference information that a CICS/COBOL programmer needs into one handy, easy-to-use source book. It has been a favorite of programmers on the job ever since the first edition was published in 1987. DB2 is IBM's database management system, and this two-part series shows how to develop COBOL programs that use DB2. Part 1 presents the basic skills that all DB2 programmers need. Part 2 presents advanced skills, with a chapter on how to access DB2 data from CICS programs. This chapter introduces the IBM and CICS concepts and terms you need to understand if you’re going to do CICS/COBOL programming. This chapter presents a complete, pseudo-conversational CICS program that shows you how all the pieces of a CICS program fit together. This download contains the source code for the 12 complete programs in the book. These are variations of a menu program, customer inquiry program, customer maintenance program, and order-entry program, and they are typical of the applications you’ll develop and maintain. This download also contains a Readme.txt file that summarizes what programs are included and how they relate to the chapters in the book. On this page, we’ll be posting answers to the questions that come up most often about this book. So if you have any questions that you haven’t found answered here at our site, please e-mail us Thanks!